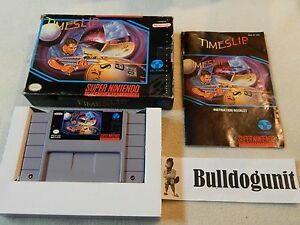 Time Slip Super Nintendo Cartridge Only SNES Authentic! you'll solve a few minor puzzles. this game tends to be a bit of a contra ripoff.a doctor in the future gets destroyrd by aliens.he then travels back to the past to stop the alien invasion from ever happening.you are armed with a machine gun the can be upgraded three times and you have 4 types of bombs as well.they allhave different traits to them.you can obtain an occasional stint of invisibility and a few random one ups.there are five missions,each with many levels to play.some levels have you riding a hover bike,which is a tad bit frustrating when the shots don't line up.there are no continues at all. the game play is cheap and the game is a bit difficult at times.i would avoid playing this game and find something better. Jogo de ação envolvente, com boa qualidade de som e gráficos. Para quem gosta de jogos como Super Contra III, está é uma boa opção. Mas antes de comprar, pesquise muito preço. 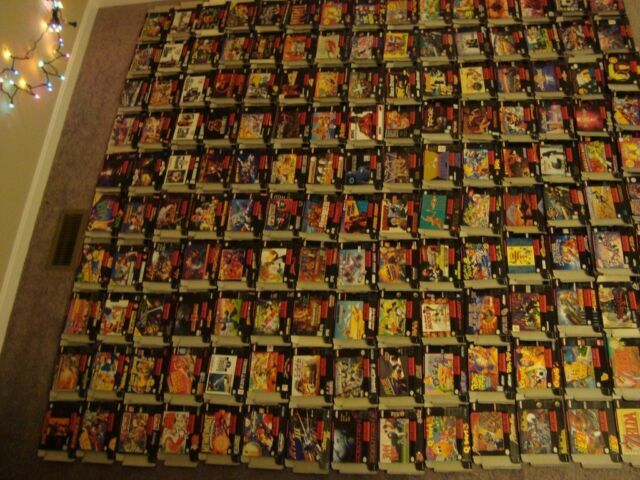 Por não ser um jogo tão comum, alguns vendedores pedem valores altos, principalmente para os jogos CIB (Complete in Box /// Cartridje Instructions Box).